Over the past few days, I've been doing my fair share of blog reading, and I've come across something I haven't seen since taking a project-heavy sound class last year. It's the Creative Commons license, which allows others to share and build upon content that you have created as long as they either give you credit or abide by certain rules, such as sharing alike or not using your content for commercial purposes. The easiest way to let others know if and/or how they can use your work is to place a Creative Commons license logo on your blog. If you scroll down a little on my blog, you can see the license I am using. For Blogger, it is a very simple process to add your own. 2. Choose how you want others to be able to use your work. Mine is set to allow modifications as long as the person using my work shares alike, and I do not allow commercial use of my work. The pictures on the right will change depending on what you choose. 3. 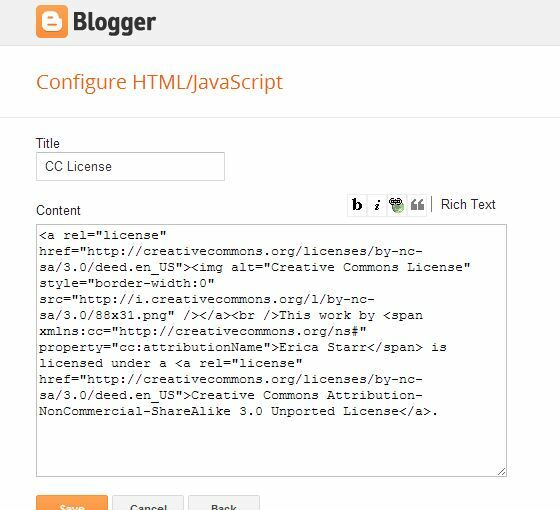 Fill in any of the optional information that you wish, and look to the right to see how the license will appear on your blog. Copy the code that you see in the last box once you are finished deciding how you want the license to look. 4. Now, head on over to your own Blogger dashboard and go to the "Layout" section. 6. Click the Add button and fill out the boxes with a title and the code you copied from the Creative Commons page. Don't forget to click Save. You will be brought back to the Layout page, where you should see your license added. Move it to the location you want it to be on your blog. I put mine right after the Share It feature. 7. Then, preview your blog to see if you like where the license is located, move it around until you do, and save your layout arrangement. 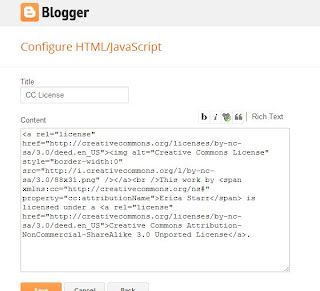 If you look on your blog, your new CC License should be available for all to see. For more information about Creative Commons, be sure to check out http://creativecommons.org. *This post is now available as a downloadable presentation on Slideshare! Check out my other post to learn 5 Easy Ways to Increase Traffic To Your Blog!